Tulips, Daffodils and other cut flowers will soon be in full bloom from now through April in Oregon’s Willamette Valley. Spring is just around the corner and a beautiful time to plan a trip to the Willamette Valley and the Wooden Shoe Tulip Festival, which opens March 23 and runs through April 30. Enjoy the flowers along with a variety of activities each day and special events on the weekends. This time every year they open their fields and expand their operations to include taking bulb orders, cut flowers, potted tulips, a gift shop, other plants, and all sorts of food and activities on weekends. Are you a painter or a photographer? Whether amatuer or professional I would imagine this would be an amazing place to spend some time. After a day in the fields, just up the road from Wooden Shoe Tulip Farm rest your head at the Willamette Valley member inn of the Oregon Bed and Breakfast Guild. ‘Giant rabbits jumping over tulip fields? Okay, the giant rabbits might Only be Slightly Exaggerated in Travel Oregon’s whimsical marketing campaign. The videos of Travel Oregon’s Oregon, Only Slightly Exaggerated reveal whimsical scenes of enchanting forests, vineyards, rivers, mountains and more, and share with you that magical feeling of being in Oregon. Now the captivating artwork is coming to the real world, proudly hand-painted on walls in Oregon where the illustrations represent the destinations. Let the Oregon Mural Trail inspire you to get outside and experience the wonders of each community. Take photos of the murals and use the hashtag #OregonIsMagic in social posts to share the love. And while you’re there, visit the landmarks and businesses that make these towns just so magical. The featured mural was dedicated yesterday in The Dalles,Oregon. A historic city on the sunny eastern end of the Columbia River Gorge, The Dalles is fortunate to have easy access to rivers, hiking trails and scenic drives. 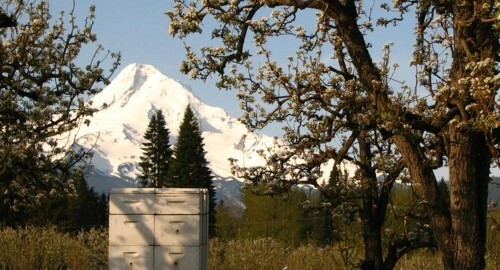 Geocaching in Oregon is nothing new as the game started here. On May 3 this game, once known as the “Great American GPS Stash Hunt’, celebrates it’s 17th birthday with now over 3 million hides world wide. A little history lesson here, the full version can be read on the Geocaching.com website where I pulled this information. You’ll find that discovery, exploration and adventure still exist in the real-world. It gets you out and about! The changing weather means that you may have a sneak peek of summer sunshine in spring, or could indulge in ski or snowshoe caching in autumn! The Central and Eastern Oregon museums will take you back in time. A glimpse into an ever changing Oregon, it’s indigenous people, hearty immigrants, and hard working cattlemen. Tamástslikt Cultural Institute where the history, culture and hospitality of the people who have lived on this land for more than 10,000 years comes alive. More than just a museum, Tamastslikt celebrates the traditions of Cayuse, Umatilla and Walla Walla Tribes. Kam Wah Chung State Heritage Site in John Day, Oregon, is a must-see for anyone with an interest in Oregon history. This structure was built as a trading post on The Dalles Military Road in the mid-1800’s. Chinese businessman Lung On and herbal doctor Ing Hay worked out of this building. Dr. Hay administered care to the Chinese gold-mine workers, pioneers, and others from the John Day area and beyond by using traditional Chinese remedies. Built to preserve the legacy of the Chinese workforce in Oregon, the museum contains artifacts and displays that share some of the trials of everyday life of these people. They walked for 2,000 miles…men, women, and children by the tens of thousands. The story of this journey comes alive today through the life-size exhibits at the National Historic Oregon Trail Interpretive Center, Baker City. The museum offers living history demonstrations, interpretive programs, exhibits, multi-media presentations, special events, and more than four miles of interpretive trails. 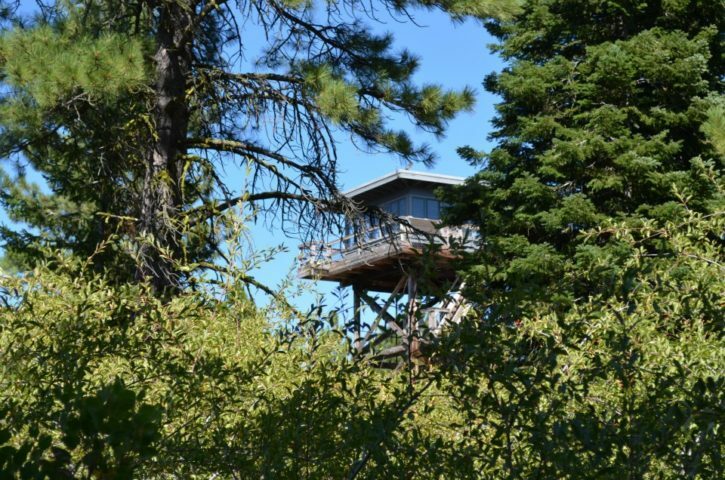 Let the innkeepers of the Oregon Bed and Breakfast Guild share their knowledge of these unique museums and many other natural attractions in the beautiful and vast expanse of Eastern Oregon. These are but a few of the many historical museum located in Central and Eastern Oregon. 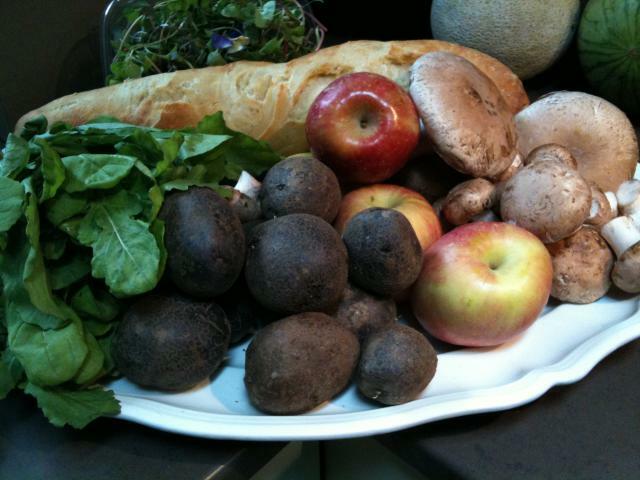 Oregon Bed and Breakfast Guild is ready to share Oregon with you: it’s environment, culture, and heritage. 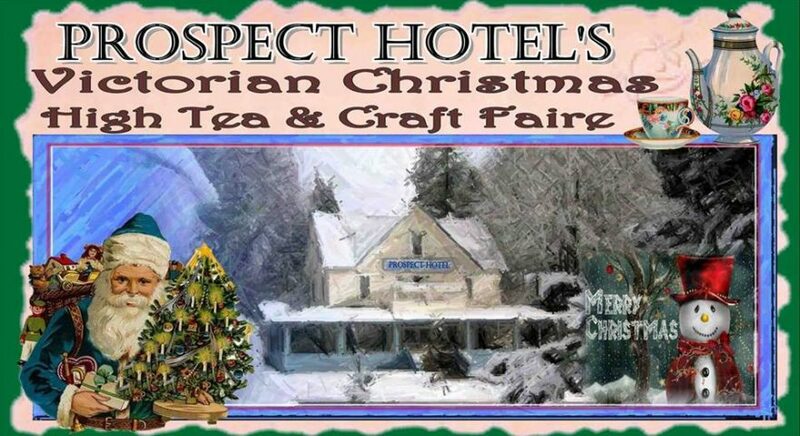 Combine gracious hospitality with ambiance at an inspected and approved Oregon Bed and Breakfast Guild member Inn. Wheeler County Events and Wilson Ranches Retreat for true Pioneer hospitality! At the ranch enjoy scenic horseback rides, cattle drives, hiking and 4X4 sunset ranch tours on a 9,000 acre working cattle ranch. Close to the John Day Fossil Beds National Monument, bass fishing, river rafting, and golfing. 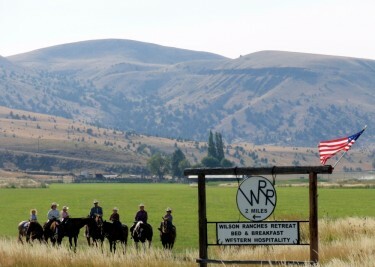 Wilson Ranches Retreat can be your home base when visiting Central Oregon and attending Wheeler County Events. The Wheeler County Bluegrass Festival has grown steadily over its history and is noted for its pleasant rural atmosphere. The Festival takes place in the old pioneer town of Fossil in front of the beautiful brick courthouse, now over 100 years old. Bring your lawn chairs, relax and enjoy the car show and live music. Entries begin at 9:30am and close at 11:30am. Awards at approximately 3:30pm. $15 pre-registration; $20 day of show. A traditional small town, county fair complete with 4-H livestock exhibits, a parade, NPRA rodeo action, live music, and a whole lot of family friendly fun. Recently we took a road trip on one of Oregon’s 26 Scenic Byways, Oregon Outback Scenic Byway. 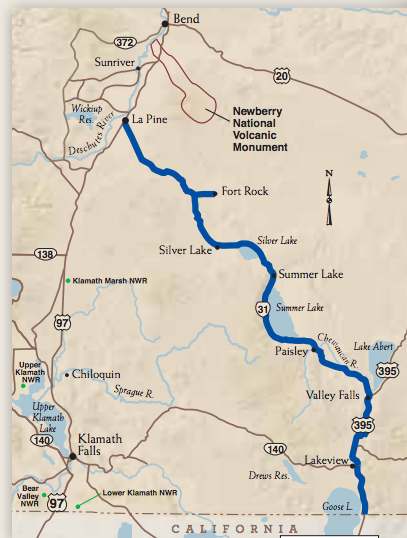 This byway takes you through a slice of the Great Basin, an isolated diverse landscape, where lush green forests of the Oregon Cascades are replaced by sagebrush and stunning rock formations. See striking evidence of mysterious rock formations left behind by volcanoes at Fort Rock. 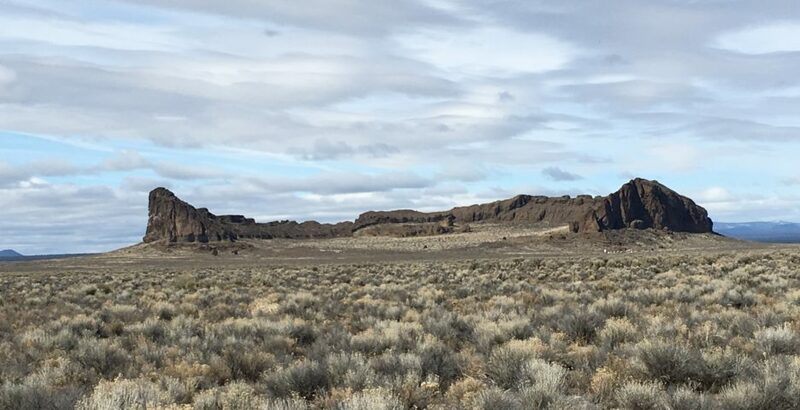 The Abert Rim is a 30-mile-long fault escarpment, one of the nation’s longest and most continuous fault escarpment that rises more than 2,000 feet above the Byway. Take a few minutes to stop at Picture Rock Pass, named for ancient Indian petroglyph-decorated rocks that are within walking distance of the highway. I discovered these while seeking Geocache GC18MWG ‘Between Basins’. Yes, I am a cacher and, as everywhere in Oregon, there are plenty for you to hunt for. Don’t miss Lakeview Geyser Earthcache GC23CK7, the Old Perpetual Geyser. Picture Rock Pass offers panoramic views of the lakes and forests. Stunning Winter Rim divides forest and desert and as the Geocache ‘Between Basins’ suggests, ancient lake basins. The Paisley Caves, discovered in the cliffs above the Great Basin, have revealed fossils and evidence of human habitation as long as 14,000 years ago. We also took advantage of a soak in the mineral baths of Summer Lake Hot Springs. You won’t want to miss that. At Wilson Ranches Retreat, your hosts, Phil and Nancy Wilson, are fifth generation Oregonians, whose families homesteaded in Wheeler and Gilliam Counties over 100 years ago. A 9,000 acre working cattle and dude ranch takes you off the beaten track to a rustic hideout, located in the beautiful Butte Creek Valley three miles West of Fossil, Oregon off Highway 19. This incredible, secluded scenic Oregon Lodging Ranch with spectacular sunsets and brilliant star-studded nights will captivate you. Enjoy horseback riding in a geologically and historically rich area with a magnificent view of the Cascade Mountain Range or a quiet hike to view the wildlife and diverse flora and fauna on Wilson Ranches Dude Ranch. Wheeler County is home of the John Day Fossil Beds National Monument and has the richest find of prehistoric fossils in the world.